Thanks to the great crew in the photo below, we had a successful 5th Ride of Silence last night. Along with 48 countries, 7 continents and 50 US States, 37 riders participated in the ride on a beautiful, sunny May day in total Silence. If you didn’t get a chance to come out last night, please consider it for 2018. It is a truly humbling and moving experience. 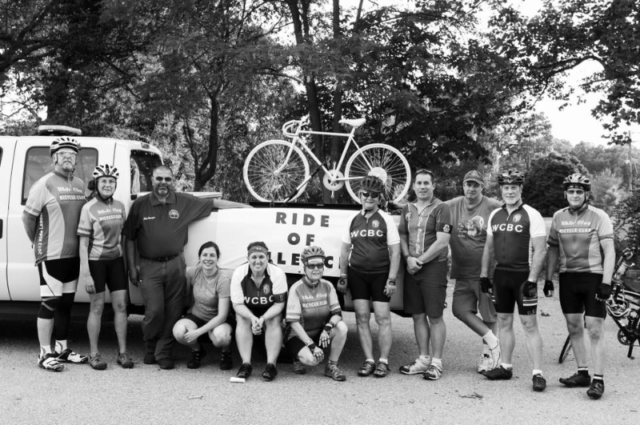 This ride would not be possible without the help of a ton of folks including (L to R): Charlie Johnston, Ceci McCormick, Mark (City of Wilmington), Leah Kacanda (City of Wilmington), Emily Ciancio, Gail Robillard, Darree Clark, Chris Lano, Dave Anderson, JW Haupt and Brian Donovan. Not pictured: Mat Smith (photographer), Brian Witte, Ed Pankowski, Officers from the City of Wilmington – THANK YOU ALL!!! ← Do You Even Zwift, Bro?